A Short History – Frye Electronics, Inc.
Frye Electronics was born in a basement in 1970 because Maud Frye wanted her son George to build her a hearing aid to replace her old Zenith. At the time George was designing oscilloscopes for Tektronix, so putting together a little amplifier didn’t look like a very difficult job. He was wrong. It wasn’t as easy as he thought; but he persisted and came up with a rechargeable body aid that satisfied his mother. And now that he had a product, he might as well sell it to others. Then the real story of Frye Electronics began. In typical engineer fashion, he decided the best way to market his aid was to show its electroacoustic qualities. So he built a simple hearing aid analyzer, the FONIX 5000 in a bright orange box. It became immediately apparent that there was a lot more interest in the analyzer than in the hearing aid. And building test equipment was more fun anyway. With some samples in his car, he traveled the country and found support from special instrument people like Gordon Stowe, Al Brandemeier, Chet Jelonek, and from Julia Davis at the University of Iowa. 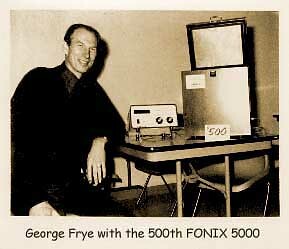 In October of 1973, Frye Electronics was incorporated with three employees, two of them working for stock alone, and the third, George Frye, working at half salary. The company survived and prospered. FONIX Hearing aid analyzers are now used for both quality control and for hearing aid fitting. By continually updating its products, Frye Electronics makes sure that every hearing aid on the market, no matter how innovative, can be quickly and validly tested on a FONIX analyzer. Test sequences based on all known standards are available. But sound chamber measurements aren’t the whole story. Real ear measurements are also needed for correct fitting. And here too, customer input and Frye research work together to constantly update our product design. Although its product line has recently expanded to include a dispenser’s audiometer, Frye is determined to remain the world leader in hearing aid analyzers, its most important commitment.